I love Netflix. It’s one of the best streaming services out there. They have done so much right with it. However, it is in dire need of changing one thing. The desperately need to add a higher tier to their accounts. I envision it would look something like this. I would totally upgrade to this tier and I would think that they would dominate the market if they were able to pull this off. Microsoft! Make Windows 7 SP2 already! 229 initial updates on a fresh install of Windows 7 Pro SP1 is absolutely ridiculous! Release SP2 already! I know you’re 2 versions ahead of 7 already and desperately want everyone on 10, but still! Update: So yeah, that took over an hour and a half… This isn’t including download times and this is not on a HDD but on a Samsung 950 EVO with a 3rd gen i5. Update 2: Another reason for SP2 is after the initial 229 updates, there are 24 more updates. Yup. So, I’ve been playing with animations after learning about them in the tutorial series I mentioned in my Return to Unity post. 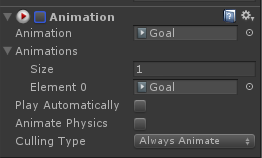 I got the animation to be where I wanted it and set up the objects script to initiate the animation. Code was good, no errors. Animation was good and all attached to the object. Everything should work, right? Wrong. Hit play and triggered the event that should animate my object. Nothing…. So I try it again…. Still nothing… I ended up spending a good 30 min to an hour trying to figure out why my object wasn’t performing the animation. I looked at a ton of different things. Tried different methods of calling the animation in my code. Nothing seemed to work. Just when I was about to give up I saw what was wrong… Let’s see if you can’t see what the issue was… It’s so dumb. You’ll probably see it in 2 seconds. Yup. See that unchecked box between the play button image and “Animation”? That means the animation is disabled… Oops. Long story short, be sure your components are properly enabled before you spend a long time banging your head against your keyboard. For the past few months I dropped learning C# and Unity 3D due to how busy I’ve been with work an my personal life. I’m looking to pick it up again a little bit now. In fact, I’ve already started on a few tutorials. Now, I can’t promise I will continue for an extended period of time due to work and personal life… Again… haha. Anyway, I decided to do something a little more simple than what I was doing before. I had started learning how to make an FPS as well as automated tile-based map creation. Now I’m going through a tutorial that is teaching me how to make a simple block based game. Now this game is really, really simple. But it will be a good, simple game to help me reorient myself into Unity 3D. So far with what I’ve done in the past and what I’m doing right now I really enjoy programming. I’ve, also, worked with other languages in the past for work and personal reasons. The language I have most experience in would be PHP/MySQL with personal websites and services. At work I’ve been learning C++ with the Arduino Microcontroller for automated validation purposes and have really enjoyed working with it. Anyway, I’ll hopefully be updating the blog more with what I learn as I learn it. Hope you all enjoy!